Minato Namikaze was the fourth Hokage of Village Hidden in the Leafs and the man responsible for sealing the nine-tailed demon fox inside Naruto Uzumaki when he was born. Doing so cost him his life, and before dying he asked that the villagers not see Naruto as the monster within him, instead wanting him to be viewed as a hero, a request ignored by the villagers. Naruto Shippuden reveals that Naruto is the son of Minato, born to Kushina Uzumaki. 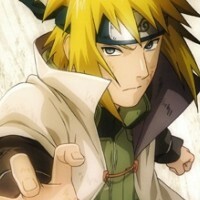 In his youth Minato, along with two other unknown Genin, was a student of Jiraiya. Prior to becoming Hokage, he was also the sensei of Kakashi Hatake, Obito Uchiha, and Rin Nohara. Minato is said to be one of the greatest ninja the Hidden Leaf has ever produced, with natural talent that had not been seen in many years. He specializes in using the Flying Raijin Jutsu, a technique the Second Hokage, Tobirama created, which essentially allowed him to teleport to any location with the use of a special seal. By attaching the seal to a kunai or an enemy, Minato could teleport to the location of the seal unnoticed, allowing him to wipe out nearby opponents almost instantly. This ability led to his title as "The Yellow Flash," and it caused him to be seen as so dangerous that a flee-on-sight order was given in regards to him during the Third Ninja War. He also created the Rasengan, a technique that does not rely on hand seals but instead uses a concentration of spinning chakra in one's palm that causes immense damage to its victim on contact. Later during the Fourth Great Ninja War he is resurrected by Orochimaru with Reanimation Jutsu alongside all the other deceased Hokage. After he goes and joins the battlefield along with his fellow Hokage to help the Allied Shinobi Forces in their fight with the Obito Uchiha, Madara Uchiha and the Ten-Tails.